The UK Automotive 30% Club hosted its second annual conference at Toyota Academy. Gaia Innovation’s CEO, Julia Muir, is also the founder of the UK Automotive 30% Club – an automotive working group with a goal of having women in 30% of key leadership positions by 2030. On November 2nd 2017 Julia Muir brought the second annual conference of this progressive group of automotive leaders to the Toyota Academy in Derby. Over 70 automotive leaders came together to share ideas, including influential speakers from retail and manufacturing automotive organisations. 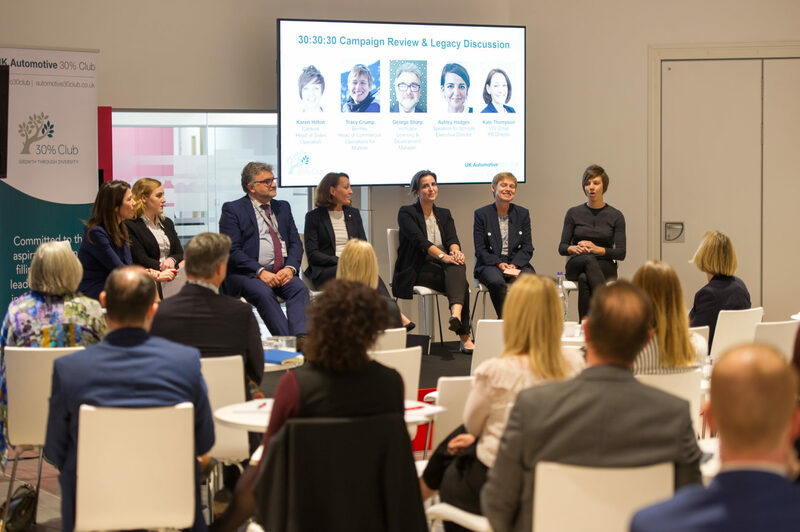 The exciting theme of the conference was ‘reaching 30 by 30’, with the aim of filling at least 30% of key leadership positions in the member organisations with women by 2030. Julia Muir hosted two insightful and thought provoking panel discussions, encouraging the audience to share ideas on ‘reaching 30 by 30’. The aim of the 30:30:30 campaign is to inspire young women to consider careers in the automotive industry. Tips and techniques were shared on how to effectively engage with schools. The second panel then discussed the actions to be taken to reach 30 by 30, and how organisations can overcome resistance or fear of change. By attending the conference, guests learnt, participated, connected, contributed and networked with those sharing the same aspirations in increasing gender diversity in the workplace, with the aim to reach ’30 by 30’. Most importantly, guests went home inspired to try new approaches, enabled and equipped to be more innovative and improve gender diversity within their organisations. Darcey Pagin, a sixth form student at Rossington All Saints Academy, was shadowing Julia that week as one of the 30 female students taking part in the 30:30:30 Campaign. She participated in the panel discussion, and shared her opinion of how the industry can attract more female students to automotive careers. The event was managed and directed by Nicola Thompson, Client Engagement Director at Gaia Innovation. Ingrid works in the National Markets business of KPMG, working with clients to address their workforce issues. She led the “Cracking the Code” gender diversity research on the health of the female pipeline in UK organisations in conjunction with The 30% Club and YSC. Ingrid is now working with clients on Diversity & Inclusion strategies and the new Gender Pay Gap reporting requirements. Katie Ward has been with Working Mums for over 8 years heading up their business development and corporate functions for advertising, events and sponsorship. She works with a variety of organisations where gender diversity is a big focus, along with a desire to attract skilled professional women into their organisations. Dr. Terri Simpkin is engaged in a full portfolio of eclectic and rewarding professional activity. She is also the Higher and Further Education Principal at CNet and Managing Director of Mischief Business Engineering (UK and Australia). Her current research investigates the impact of the impostor phenomenon on the careers of women and how it may be contributing to the lack of a robust female presence at board and senior organisations into the future. Sofia has been with Facebook for 4 years and is currently the HR Director for all Global Marketing Solutions teams in EMEA. She is a close business partner to all EMEA Country Directors and the EMEA GMS leadership team. Sofia previously worked as a Human Capital Consultant as well as a HR leader for Fremantle (Bertelsmann Group) and Yahoo. Rachel is a Psychologist, Executive Coach and Founder of Why Women Work, a social enterprise to accelerate gender diverse corporate leadership. Rachel also regularly presents and publishes on women in work and 21st century leadership. Rachel is also a part of the automotive working group of the 30% Club as a Steering Committee Member, as well as Julia Muir.